Oct. 23, 2017, 9:56 a.m.
From VR to AR, emerging mobile technology is going to have a significant impact on how the site engages with its readers in the real world. By Ricardo Bilton @rbilton Oct. 23, 2017, 9:56 a.m.
Atlas Obscura has built its brand and business around its mission to help people discover the real world. Now it’s experimenting with bringing that ethos to the virtual world as well. 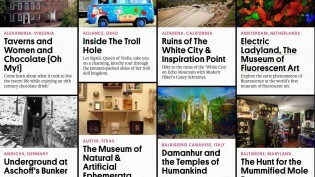 This summer, the site launched the first season of Atlas Obscura VR, a series of virtual reality videos that let viewers explore exotic locales such as the Temples of Damanhur in northern Italy, the Salt Mines of Salina Turda, Transylvania, and California’s Winchester House of Mystery. The videos, designed for Samsung’s Galaxy Gear VR and produced by production company Start VR, are designed around interactivity: Users can chose their own paths around the experiences, uncovering secrets and routes as they explore the virtual environments. The three primary locations are joined by a few dozen other places, which are explored via photos and audio. 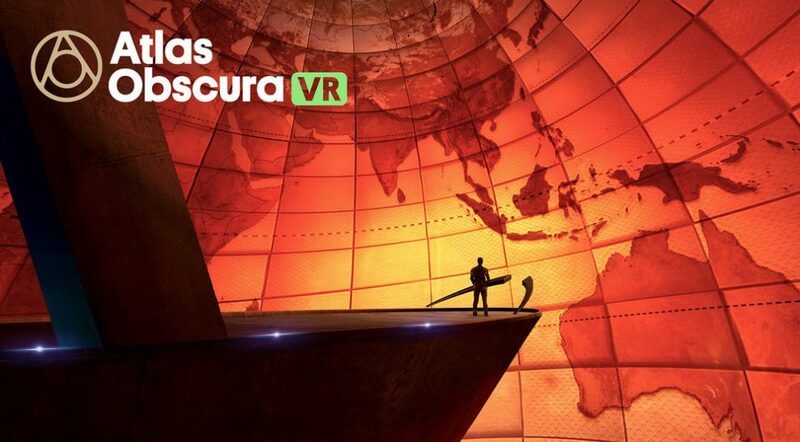 While the Atlas Obscura approach does lend itself well to the transporting power of VR, Thuras confessed that there is some tension between the technology and the site’s mission. Atlas Obscura, he said, works best when “people actually go out in the world and have an experience, whether it’s with us or by using the site to find something amazing.” VR headsets, on the other hand, tend to remain indoors, and their use can come at the expense of users going outside. Atlas Obscura has, however, largely squared away this cognitive dissonance. While the site’s core mission is to encourage readers to see the world, many locations are difficult to travel to, dangerous (such as Brazil’s aptly-named Snake Island), or closed to tourists. These kinds of places may turn out to be the perfect fit for Atlas Obscura’s VR projects and an effective way for the site to experiment wit the tech while staying true to its mission. There’s also the reality that not all readers can afford to visit the places they read about on the site. “It’s not always easy to jump on a plane and go spend a week at a new-age eco cult in in the hills of the alps,” Thuras said, referring to the Temples of Damanhur. Atlas Obscura’s investment comes despite Thuras’s belief that the technology is “still a hugely alien experience for most people.” Despite the hype, VR headsets are still only in the hands of 5 percent of the Internet-using U.S. population, according to Global Web Index. And there’s still no single VR experience. While some early adopters have flocked to the high-end headsets like the Oculus Rift, it’s the small, cheap devices like Google Cardboard that are accessible to the average person. The vast majority of people haven’t tried VR at all. “It’s a really confusing environment right now,” Thuras said, comparing the technology today to the awkward early days of giant cell phones. 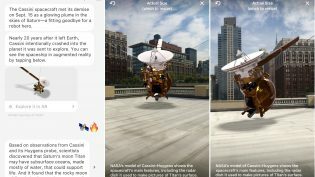 VR aside, Thuras said there might be more potential for Atlas Obscura with augmented reality, which has gotten comparatively fewer headlines but which might be more accessible for most people and more in-line with what news organizations already do. The site could, for example, use AR to create visual overlays to show users information about their current locations, as well as other interesting places nearby. It’s not an entirely new idea for Atlas Obscura. The site experimented with a similar idea back in 2013 with Google’s Field Trip, which partnered with publications like Atlas Obscura to point users to interesting locations around them. Augmented reality is also far more accessible to users. While true, consumer-grade augmented reality glasses are still in development at Apple and elsewhere, the VR platforms built into the latest versions of iOS and Android are already helping the likes of Quartz and The Wall Street Journal use the tech in their apps. POSTED Oct. 23, 2017, 9:56 a.m.
Bilton, Ricardo. "Atlas Obscura is using virtual reality to transport readers to the world’s distant, exotic locations." Nieman Journalism Lab. Nieman Foundation for Journalism at Harvard, 23 Oct. 2017. Web. 24 Apr. 2019. Bilton, Ricardo. "Atlas Obscura is using virtual reality to transport readers to the world’s distant, exotic locations." Nieman Journalism Lab. Last modified October 23, 2017. Accessed April 24, 2019. https://www.niemanlab.org/2017/10/atlas-obscura-is-using-virtual-reality-to-transport-readers-to-the-worlds-distant-exotic-locations/.